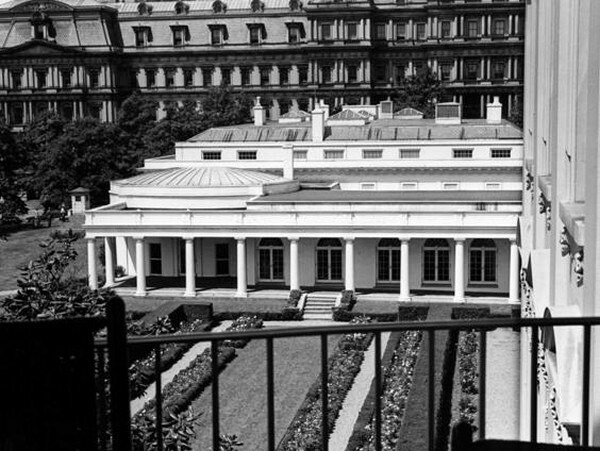 Prior to 1902, there were extensive stables, housing horses and coaches, located on the grounds of the present-day Oval Office, Cabinet Room, and Rose Garden. During the 1902 Roosevelt renovation, First Lady Edith Roosevelt insisted on a proper colonial garden to help replace the conservatory rose house that had stood here. The Rose Garden is based on a traditional 18th century American garden. The current design of the garden dates to the Kennedy Administration. President and Mrs. Kennedy were interested in having horticultural features that followed the traditions of Presidents Washington and Jefferson. The West Garden has been called the Rose Garden since 1913 when Mrs. Ellen Wilson replaced the existing colonial garden with a formal rose garden. The Rose Garden features a rectangular grass panel surrounded by flower beds and crabapple trees. The garden is steps from the Oval Office and is the stage for numerous receptions, bill signings and media events annually. More than 30 different types of tulips and grape hyacinth are planted in the flower beds that are framed and crisscrossed with boxwood. Lavender cotton, planted in the shape of diamonds, surrounds the crabapple trees. The Rose Garden was once a formal flower garden, but it was eventually converted to a broad lawn surrounded by flower and shrub plantings so that presidents could hold press conferences out in the sunny, open area with the West Wing colonnade as a backdrop.